As America reels from the bizarre presidential assassination committed by a child, seven men are abducted from their normal lives and delivered to a secret government facility. Each man has his own career, his own specialty. All are identical in appearance. The seven strangers were grown--- unwitting human clones---as part of a project called 7th Son. The government now wants something from these “John Michael Smiths.” They share the flesh as well as the implanted memories of the psychopath responsible for the president's murder. The killer has bigger plans, and only these seven have the unique qualifications to track and stop him. But when their progenitor makes the battle personal, it becomes clear he may know the seven better than they know themselves. J.C. HUTCHINS created the podcast trilogy "7th Son," and the trilogy has had more than 3.5 million total downloads. The first book will be published by St. Martin's in Fall 2009. He lives in Deerfield Beach, Florida. “J. 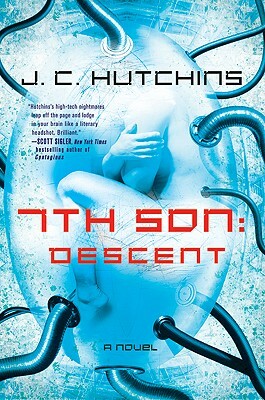 C. Hutchins takes the science thriller and pumps it full of rocket fuel in 7th Son: Descent. It has weird science, convoluted conspiracies, plenty of action, and a very creepy premise that will leave you paranoid and shaken."